Pantokrator monastery is located on the eastern side of the peninsula and is dedicated to the Transfiguration of Our Lord. It was founded by Alexios the Stratopedarch and John the Primikerios. Its operation most likely started in 1363. 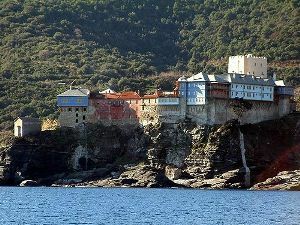 It occupies the seventh rank in the hierarchical order of the twenty monasteries on the Mount Athos. It is inhabited by 66 monks (1990) and is coenobitic (communal). The coenobitic skete of Prophet Elijah belongs to the monastery of Pantokrator. The monastery's katholikon is small, due to a lack of space. It is built in the traditional style with one slight irregularity, that is, the distance between the choirs of the cantors and the sanctuary is unusually great. The church features wall-paintings from artists of the Macedonian School and certain parts were restored in 1854. Besides the katholikon the monastery features eight chapels. Its library contains 350 codices, two liturgical scrolls and 3,500 printed books. During the recent years a few codices have been stolen from the library. Among the monastery' treasures, the most significant is a fragment of the True Cross. Since 2001 Gavril is the Abbot of the monastery, the monastery itself is inhabited by approximately 20 monks and also 42 monks from St. Ilya skete are registered in the monastery. 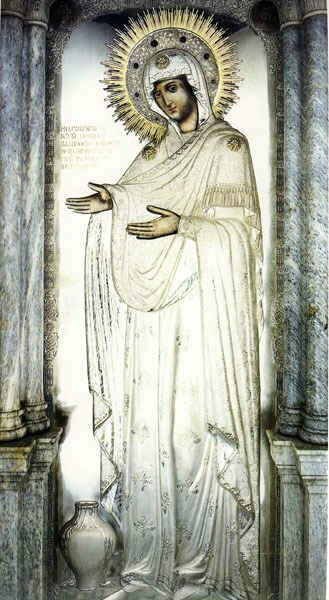 Theotokos Gerondissa is depicted in full height and elderly without Jesus. The vessel depicted on the icon is the reminder of miraculous augmentation of anointing oil in the period of starvation as a result of an abbot’s prayer. According to the myth, during the service Theotokos ordered a celibate priest to administer one of the lay brothers who was dying. Lots of miracles are associated with the icon. During Pantokator’s plunder by the Turks the icon was thrown into the well, ornaments were taken off. In the road the Turks were stricken by blindness and understood that it was the punishment for the sacrilege. Some years later the monks found the intact icon in the well. Many times the icon expressed her guardianship of the elderly people, that’s why she is called Gerondissa.